We will hear from Ben Moudry, Head of School at the Grove School. While Ben is new to the Grove School, he is neither new to charter schools nor the Montessori way. Welcome Ben! RUSD’s finest were showcased last week. Starting with our Students of the Month, we celebrated Dalia Santibanez Perez from Orangewood, Matthew Kuzdal from Citrus Valley, Rachel Koh from REV and JoAnn Johnson from RHS. Following the students, our own member and Superintendent of Schools, Lori Rhodes, gave us a glimpse into our fine school district, including the future with its many changes including curriculum and school funding. Joining her were a number of the school site administrators that make our schools tick. Country style pork ribs in sauerkraut, German potato salad, green bean almondine, salad bar and German chocolate cake. Are you catching the theme here? Happy 30th Redlands Morning Rotary Club! Yes, our friends who meet on Wednesday morning’s celebrate their first 30 years exercising Service Above Self. With us today should be several VIP’s from our partner club. Remember tonight we will be socializing with them from 5:30 to 7:30 at a location to be announced. 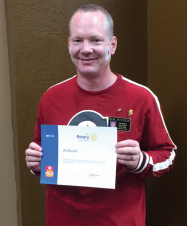 Congratulations Redlands Morning Rotary Club! The Veteran’s Day Parade is just around the corner, Tuesday November 11th. See Nathan Gonzalez on how to get involved. At the recent Rotary District 5330 Gala, past president Jim Pinder was honored for his work with Polio Plus during his year. Attire that evening was anything from another country, as you can see Jim really stretched and dressed in his native Canadian garb. The Calgary Flames jersey is nice, but not authentic as Jim has all his teeth. I’d like for all of our members to think back to 1984. Ronald Reagan was President and the Summer Olympics came to Los Angeles; the athletes from the Soviet Union did not. Average annual income in the United States was $21,600.00. Gasoline sold for $1.10 per gallon and a brand new Chrysler New Yorker listed for $13,045.00. Some of us were celebrating our fifth wedding anniversary with our first (or second) spouse. Some of us were celebrating their 25th or 30th anniversaries. Several of us were waiting eagerly for the day when we would finally leave elementary school, high school, college, or the armed services. Some were welcoming new children and grandchildren to our families. A couple of members ARE those children or grandchildren we welcomed. Redlands Sunrise Rotary began in 1984 after it became apparent that Redlands could support and sustain a second Rotary Club which would accommodate early-rising prospective Rotarians who could get to a breakfast meeting, but could not leave their other occupations and preoccupations at lunchtime. I would hazard a guess that a few of the new Club members also just wanted to start new, parallel traditions of their own as a different club. Regardless of the reasons, as they say, “The rest is history.” It’s been a great history, too, with uncountable hours of community service and innumerable lives touched by the good works of both Redlands Rotary Clubs. All members, past and present, should feel proud of what the Clubs have accomplished following the precept of “Service Above Self.” It proves the assertion that, counterintuitive as it may seem, in order to multiply, sometimes you first have to divide.